Regulator protects the plumbing in your rig against un-regulated water pressure found in some campgrounds. Lead-free unit conforms to CA and VT lead laws for drinking water fixtures. Fits all standard water hose and campground water risers. Regulates incoming water pressure to 40-50 psi. Screened washer is removable for cleaning. 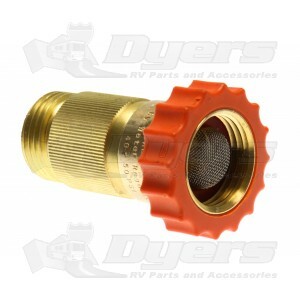 3/4" Male Garden Hose x 3/4" Female Swivel Garden Hose. 2-5/8" L x 1-11/16" Diameter overall. So I bought it because it is Lead Free, figuring it would be pretty safe for me and my family with our RV. I was a bit surprised about the warning on the back of the package: "WARNING: This product contains a chemical known to the State of California to cause cancer and birth defects or other reproductive harm" So I do wonder what it contains now... As one might have guessed, yap Made in China. Regardless of how well it works, I'd rather not have seen the California Warning.